There are many techniques available that can be used to test your hearing and your doctor or specialist will select an appropriate testing method depending on what they think the problem with your hearing may be. In many cases the person themselves or those around them have noticed a change in hearing function which has indicated a visit to the GP in the first instance, though some, depending on medical history, genetic family history or because of their employment will require regular hearing tests and monitoring in order to detect any problems early on in its development. Whispered Speech Tests. This type of test is a very basic testing technique and can be tried at home to discover whether there is any degree of hearing impairment. It is useful as an indicator of a problem that will require further testing by a specialist. All that’s involved is to simply stand behind the person being tested and whispering words or commands and finding out if anything has been heard or not. This test can be tried in the presence of background noise or without. Wide Band Reflectance. This type of test is used as a diagnostic tool for middle ear infections and has been designed to help doctors understand how changes to the anatomy of the ear caused by the infections, impacts hearing ability and why. It examines how the ear reacts and responds to sounds rather than just focussing on whether the ear can detect sound. It is a fairly new test and is still in its infancy. The Tuning Fork Test. This test is usually carried out in the audiology department and involves the use of a variety of tuning forks of different pitches and tones being struck In order to find out whether there is a difference in hearing ability of high or low pitched sounds. Otoacoustic Emissions. This test aims to monitor cochlea responses to sounds using a probe placed in the ear. Auditory Brainstem Response. Using specialist equipment, this test aims to measure the activity of the auditory nerve, cochlea and brain when a sound is heard. Pure Tone Audiometry. Sounds of differing pitches and volume are produced using an audiometer, and via headphones, the person being tested indicates by pressing a button when they hear a noise in order to discover their threshold. The sound is measured in decibels and each person will have their own threshold. Bone Oscillator. This test measures sound heard when it is sent through the bone instead of the air. A device is placed against the head on the bony part behind the ear. In the instance of sensorineural hearing loss other, more specialised testing techniques may be required and these will be discussed between patient and specialist. 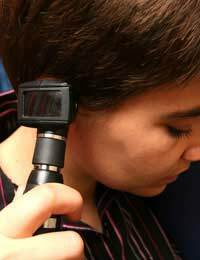 Hearing tests are an essential part of looking after your ears. Regular tests will help to detect conditions early and may help to prevent hearing loss in the future. If you are concerned about your own or someone else’s hearing, please do not hesitate in making an appointment to see your GP. I suffer a lot with dizzy spellls for the past 40 years and have had a number of test but it was never explained to me what the water test was for.......I had a "gadget" attached to each ear and warm (?) water was pumped (?) into each ear...I felt terrible afterwards and it was at least half an hour before I was able to leave the examination room yet the doctor said every thing was normal...whay did I feel so terrible (Dizzy and unable to walk for some time afterwards)....What was the water test for......Will I ever be cured ? ?